Memorial Day 2018 Everyone loves a three-day weekend! Join your friends and family in Burnet this Memorial Day weekend. Book a stay at The Verandas Guest House for a lovely and relaxing "home base" for your getaway. You'll be near to all of the attractions and events mentioned below! Start off the weekend celebrating with live music on Saturday evening, May 26, at the Trailblazer Grille on the square. This family-friendly restaurant has been featured in Texas Highways magazine and on the TV program "Texas Country Reporter." Local wineries, Perisso's Vineyards and Torr Na Lochs Winery, are both providing live music on Saturday afternoon. And don't stop there with the fun! Catch the Star Wars themed hikes and programs going on at Inks Lake State Park on Saturday. You can also enjoy a relaxing ride on the Vanishing Texas River Cruise on nearby Lake Buchanan, which is running all three days of the long weekend. 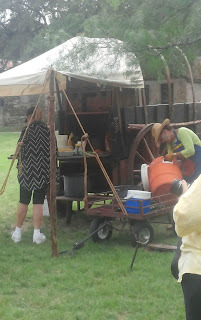 The well out front is a great topic of conversation as the lore and legend tells us that it was hand-dug to serve horses for the inn / hotel guests and stagecoaches in Burnet, Texas in the 1800s. There is an electrical switch on the side and wires running down a pole in the center that we assumed were for a pump and that it was burned out, since we could never get it to work. Also, there was an extra flood lamp light bulb in the laundry room when we bought the house that we could never figure out what it went to --- now we know! After dinner the other evening at Cafe 2300 , we had a wonderful conversation with Tom, the owner. He knew a little bit about the Verandas. He told us that previous owners had a light that illuminated the well on the porch. So, we HAD to take the grate off the top of the well and investigate. Sure enough, the wires were to a flood light -- and the switch was to the light! So, we were off to Hoover's Hardware to get supplies to replace the socket and re-wire the light! A few minutes later we lowered the wire and flipped the switch... The water is so BLUE looking! We had NO IDEA! It is much deeper than we had imagined, and it seems to be coming from two separate streams from the north and east. Come see for yourself! The Crockett Suite is right by the well. 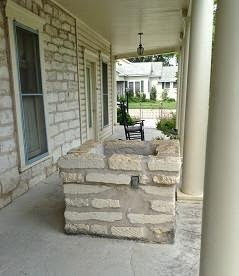 Reserve online now at verandasburnet.com or call (512) 588-0088, and we'll be happy to show you this fun new feature at The Verandas Guest House. Are you ready for bluebonnet season? 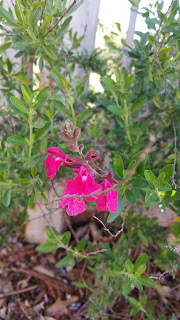 It's not even springtime in the Hill Country yet, and we already have lots of our garden plants showing off! If you get ready to come see the wildflower trails in the Burnet area, The Verandas Guest House is a great lodging location for you to spend an evening or a weekend! The front garden salvia, mountain laurel, rosemary, and roses have started putting on color this week. The wisteria on the patio gate is blossoming and smelling wonderful! 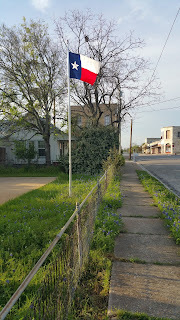 And of course, the bluebonnets don't want to be left out. Lots of sprouts in the front yard and even a few beauties trying to make an early appearance! We're starting to see patches along both highways through town. Should be a great year! Reserve your weekend at The Verandas Guest House www.verandasburnet.com! 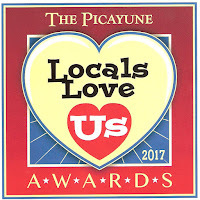 Each year, one of our local news agencies - The Picayune and KBEY 103.9 FM has its readers and radio listeners vote for their favorite places in the Highland Lakes area. On Valentine's Day, The Verandas Guest House received its award for Favorite Bed and Breakfast in Burnet! What a way to feel loved! This is the 4th year in a row that we have been named a Locals Love Us winner. We're so grateful to all of our guests, friends, and neighbors who vote for us each year. Here's our award sticker! We can't wait to put it up! Some other categories that might help our guests plan a visit to Burnet, Texas. As you can see, there's a lot of great places to go and fabulous things to see and do when you come visit! Best Food / Drink Best BBQ - BBQ Shack Best Chicken Fried Steak - Crazy Gal's (come HUNGRY if you order the large!) Best Burger - Bill's Burgers Best Coffee - Mojo Coffee Best Frozen Treat - Happy Scoops Best Bakery - Gude's Best Asian Restaurant - Aranya Thai Best Iced Tea - Trailblazer Grill (their peach iced tea is the best!) Best Shopping & Things to Do Best Antiques - Finds of All Kinds Best Florist - Lizzy's Flowers Best Park - Inks Lake State Park Best Golf Course - Delaware Springs Best Community Event - Summer Concerts in Haley Nelson Park Ready to come play and stay? Make your reservation at verandasburnet.com or call us at (512) 588-0088 and we'll help you with your getaway! The Verandas is a Pokemon Go PokeStop! Pokemon Go! is a popular app that was released this week. 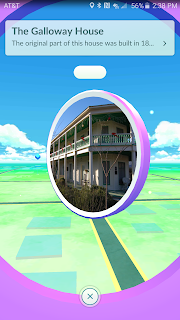 Since The Verandas Guest House in Burnet is a Texas historic site (The Galloway House), we are a "PokeStop" where players can earn / win items for their game. We have seen excited youngsters lingering at the Centennial Marker on the corner of Pierce and League Streets building their Pokedex. Players tell us that you can catch Rattata and Paras on the sidewalk outside the fence of The Verandas. We hope players use good safety sense and look before crossing the street to catch their Pokemon near The Verandas / Galloway House. We also ask that you please be courteous to our guests and not come inside the fence. Have fun "catching them all!" Millennials, remember we are more than just a historic building and PokeStop. If you are enjoying playing this version of a favorite throwback childhood game, and you would like to stay overnight, please call us at (512) 588-0088 or reserve online at verandasburnet.com. Celebrate the beauty of Mother Nature this Mothers' Day in the Hill Country. 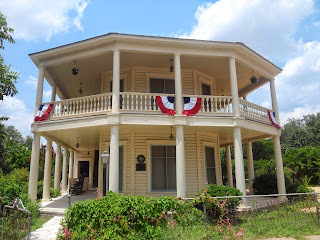 Bring Mom for a weekend getaway at The Verandas Guest House in Burnet, Texas. We have plenty of scenery and lots of events in Burnet to help make her day special. Here are some ideas for a fun-filled weekend agenda that is sure to surprise and delight your mother! Start your weekend with live music at Cafe 2300 for dinner Friday night. They offer American cafe fare, and there is a gift shop next door for a little Mothers' Day gift shopping. Then relax in your private suite in a clawfoot bathtub and get a restful night's sleep to prepare you for your wonderful weekend. On Saturday, May 7, after a delicious breakfast at Crazy Gal's Cafe (included with your stay), venture over to the historic Burnet County Courthouse square for the City Wide Garage Sale and the Burnet Farmers' Market from 9 am to 1 pm. Grab a cup of coffee at Unshakeable Grounds to enjoy with your stroll. There are a lot of great shops for more shopping on the square such as All Mixed Up, Burnet Antique Mall, Carolees, The Grapevine, and Sassy Ann's. You can get a reservation to head out to the Vanishing Texas River Cruise for a scenic tour of one of our local waterways and order a lunch with your cruise, or make a reservation at Fall Creek Vineyard's annual Mothers' Day Luncheon in Tow. Enjoy the breathtaking views on your leisurely drive. You can continue a mini wine trail tour at Perissos Vineyards and Tour Na Lochs Vineyards on your way back down Highway 29. Dinner and live music options include Jeff Hughes performing at Trailblazer Grille on the square starting at 6 pm. Dine at Bill's Burgers or The Highlander and then go down the street a few blocks for a free outdoor concert featuring Two Tons of Steel at Haley Nelson Park at 7:30 pm. Want a quieter serenade? Spend the rest of your evening outside your suite, relaxing in your rocking chair on the veranda while the frogs in the pond sing for you! Ready to make it all happen? Reserve your suite online now at verandasburnet.com or call (512) 588-0088, and we'll be happy to help you with your reservation. 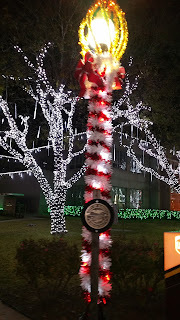 The Burnet County Courthouse has a new Christmas lighting look! Come visit this holiday season and see the "dripping" icicles and candlestick lampposts. Burnet, Texas is getting ready to celebrate the annual Christmas on the Square on Saturday, December 12. There will be performances by local entertainers such as the Burnet Gunfighters, a Christmas parade around the square, shops and restaurants open late, a visit from Santa, Main Street Bethlehem, and an old fashioned Fort Croghan Christmas. Come enjoy a fun weekend in Burnet at The Verandas Guest House any time during December. We'll be decking our halls and trimming our tree, too!Call us at (512) 588-0088 or visit online at verandasburnet.com to make your reservation.